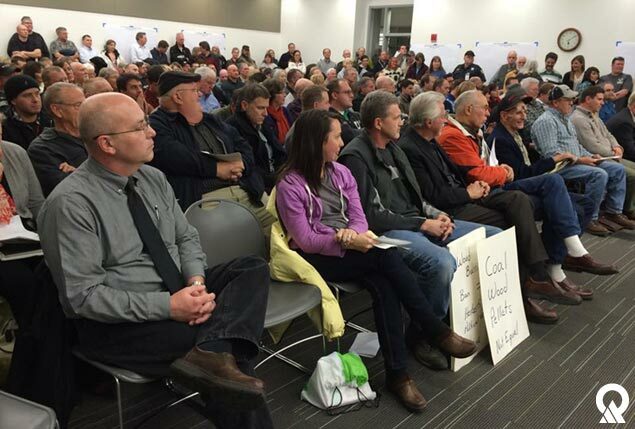 A full house at a DEQ public hearing. DEQ encourages the public to participate in the agency’s decision-making process. I understand people’s frustrations when they take the time to submit a written or verbal public comment on a regulatory proposal and at the end of the process, the final rule or regulation doesn’t seem to reflect their comment. They walk away with a feeling their comment doesn’t really matter. That’s not entirely true. Public participation is essential to developing more effective rules and regulations. The Utah Department of Environmental Quality (DEQ) depends on it. When drafting a rule, DEQ scientists do their best to base it on science and the law. They reach out to experts, but they also count on the public and others to identify flaws and offer solutions to reach a better outcome: protective, reasonable regulations without unintended consequences. DEQ’s five divisions rely on their governing boards to enact rules and regulations based on staff recommendations. 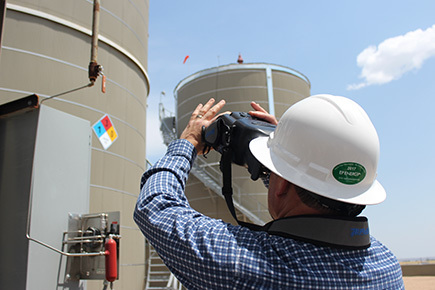 The Division of Air Quality (DAQ), for instance, is seeking public comment on proposals that streamline the oil-and-gas permitting process. The Air Quality Board has set a public comment period to run from Oct. 1 to Nov. 15, 2017. Public hearings are scheduled for Oct. 19 in Salt Lake City and Oct. 25 in Vernal. In light of these proposals, I asked Mark Berger, manager of the Air Quality Policy Section, and Joel Karmayzn, an air-quality scientist who drafts many of the air-quality rules, to provide some tips for making effective public comments. Comments that provide new information the agency has not yet considered or offer possible solutions to the problem are helpful. For instance, DAQ staff recommended exemptions to the recently proposed solvent rule for certain types of consumer products that are environmentally friendly. This recommended change to the proposed rule is based on comments that lowering the Volatile Organic Compounds (VOC) content requirements in solvents without including exclusions for high-vapor pressure solvents is counter to using environmentally friendly solvents. Industrial commenters are able to provide industry specific analytical information that is beyond DAQ’s expertise, thereby helping to refine the rules. For instance, advancements made in aerospace technology and composite materials have made some pollutant categories obsolete. Although helpful to explain why a rule doesn’t work, it is more helpful to suggest alternatives and substitute language for the requested change. For instance, staff is recommending to the Air Quality Board that the solvent rule exempt solvents used in analytical laboratories after commenters pointed out that those same solvents are required by the Environmental Protection Agency-approved analytical methods. Comments that offer opinions or raise questions unrelated to the proposed rule or permit are not-so-helpful. The public comment process is not a vote – one well-supported comment is often more informative than a hundred emails or form letters that raise the same point. DEQ will not respond to each one, but will note it received the same comment multiple times. Read and understand the proposal you are commenting on. For example, if the proposed regulation is reducing VOCs in wood furniture coatings, but the comment is about banning wood smoke, that comment isn’t relevant to the issue at hand, and staff won’t respond to it. You may have a great suggestion for improving Utah’s air, but it may require Legislative or Governor approval. Understanding the regulatory authority can help support your claims. Questions are welcomed! However, they are not considered comments. If you have one, give the contact person a call. DAQ includes contact information for its rule experts on the public-comment page. Often getting clarification on a question will help you formulate a better comment. Public participation matters! DEQ welcomes and encourages it. We are committed to using the public notice and comment process to improve the decisions we make. If you have additional questions about the public notice and comment process for a specific proposal, please contact us at (800) 458-0145, or visit our website at deq.utah.gov. 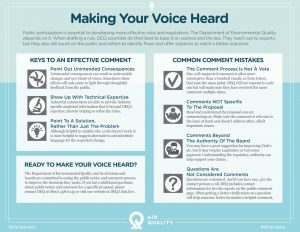 Visit our webpage “Making Effective Public Comments to DEQ” for answers to frequently asked questions and additional information on the public comment process. I am the Communications Director for DEQ and a former reporter for the Deseret News. I write an occasional blog. You can find me on Twitter @deqdonna.